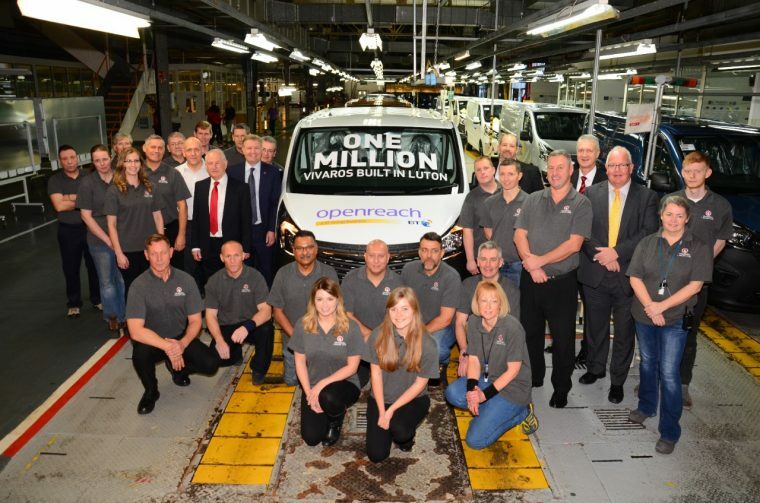 The Vauxhall manufacturing plant in Luton has set a new milestone for production with its 1 millionth Vivaro-type van. Appropriately enough, the record-setting Vivaro van was produced for BT Fleet, which is Vauxhall’s biggest customer for the Vivaro product line. Through November, Vauxhall has already sold 24,500 Vivaro vans, and it has sold nearly a quarter-million Vivaros in the UK alone over 13 years. BT Fleet’s Senior Customer Relationship Manager Mike Langford was on-hand to accept the keys for the 1 millionth Vivaro. In 11 years, BT Fleet has purchased an amazing 13,368 Vivaros from Vauxhall. The Luton plant has been operating since 1905; over the course of 110 years, the facility has produced more than 8 million vehicles, 52% of which have been exported to other European markets.